Marseille, (English alt. Marseilles — Provençal Occitan: Marselha in classical norm or Marsiho in Mistralian norm — Origin: Greek: Massalia / Μασσαλία) is the second-largest city of France and forms the third-largest metropolitan area, with 1,516,340 inhabitants at the 1999 census and 1,605,000 inhabitants in 2007 after Paris and Lyon. 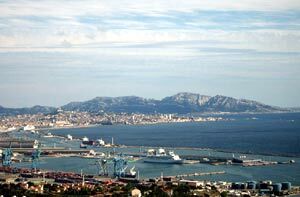 Located on the south east coast of France on the Mediterranean Sea, it is France's largest commercial port.